Thin set mortar, made from portland cement, is the “glue” that holds the modern tile industry together. 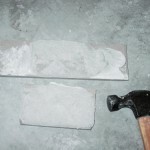 A product of the 1950s, thin set, then known officially as “dry set mortar,” ended the eons-long practice of bonding tile and stone to substrates with pure cement, a process which was time consuming and tedious. Henry M. Rothberg, founder of the Laticrete company, is credited with pioneering the switch from pure portland cement to thin set mortar. Nowadays, the old process is rarely used in developed countries. There are presently thin sets for everything, and some of them will stick to everything. “Modified” thin sets contain latex or plastic polymers that give them more flexibility and glue-like qualities. There are thin sets that bond very well to glass, for example. And then there are un-modified thin sets that are now called “dry set mortars.” There are various brands and grades of dry set. At the John Bridge Forums we urge people to use the best dry set they can obtain. Never buy the builders’ grade product, the price leader on the shelf. Go “top of the line” for only a few dollars more. Your project deserves it. 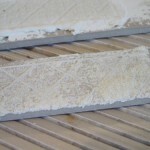 Several years ago Schluter Systems®, the maker of the Ditra and Kerdi tile setting membranes, announced that the company would no longer support the use of modified mortars in the bonding of tile and stone to its membrane products. Only un-modified dry set mortar could be used. The mortars used to bond the membranes to substrates would remain “appropriate to the substrate,” meaning that modified mortar would continue to be used in bonding Ditra to plywood, for example. A wave of controversy and misunderstanding developed as a result of that announcement. Most tiles are made from porcelain today, and for years thin set manufacturers and the tile industry in general have insisted that porcelain tiles be bonded with modified mortars. And here is Schluter stating flatly that you should bond all tile and stone with dry set mortar when using Kerdi and Ditra. So who should you listen to, the person who makes thin set or the one who makes the membrane? Since some modified mortars need air to dry, Schluter is concerned that trapped between two impervious surfaces, say Kerdi and porcelain tile, the mortar might never fully set. And since Schluter does in fact make its own products, the company certainly has the right to decide which adhesives can be used in their installation. Quite a dilemma indeed. Wouldn’t it be great if Schluter were to come out with its own brand of dry-set mortar and guarantee it to work with Schluter products? Well, the next best thing has happened. Schluter Systems has licensed the Bostik company to use the Schluter name on a product specially developed for use with Ditra and Kerdi. The product is called Ditra-set, and it’s a humdinger. I have used Ditra-set twice, both times when doing Kerdi showers. When the product was first developed in 2006, my friends at Schluter asked Bostik to send me a couple sacks to try out. I used the material on a Kerdi shower I had in progress, and while I was at it I bonded a couple scraps of porcelain tile together as a test. 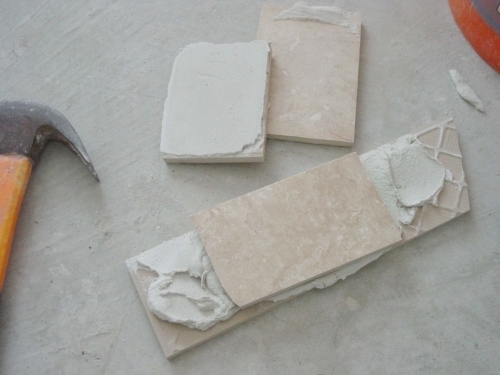 Fragments of large impervious porcelain tiles were bonded together at 3:00 in the afternoon. 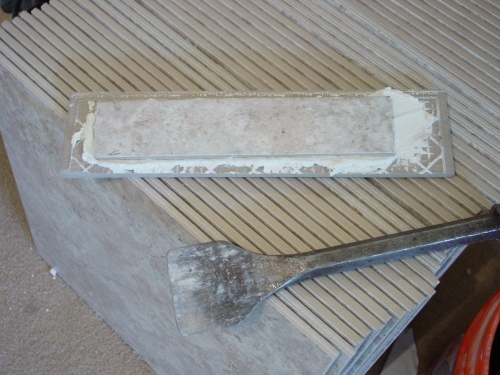 Arriving on the job the next morning I attempted to pry the pieces of tile apart with my margin trowel. It’s not unusual for thin set to remain somewhat pliable after only 16 hours, especially when it’s between two pieces of impervious tile (or between impervious tile and a waterproof membrane such as Kerdi). 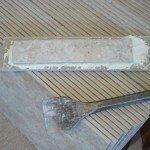 I had no luck with the margin trowel no matter how hard I pushed, so I got out my trusty masonry chisel. Tile fragments were broken apart with hammer and chisel. Dry set mortar isn’t supposed to stick to porcelain tile, is it? That’s what I’ve been told for years, even though years ago I spent a lot of time bonding porcelain tiles to concrete floors in bank buildings all over Texas, Arkansas, and Mississippi with dry set mortar. 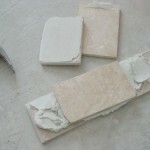 I’m here to tell you porcelain tiles can indeed be bonded with dry set, especially with Ditra-set. You can see that when the pieces were separated a good amount of thin set remained on each piece — the bond broke somewhere in the middle of the material; it didn’t cleave off one piece or the other. That’s called good thin set transfer. 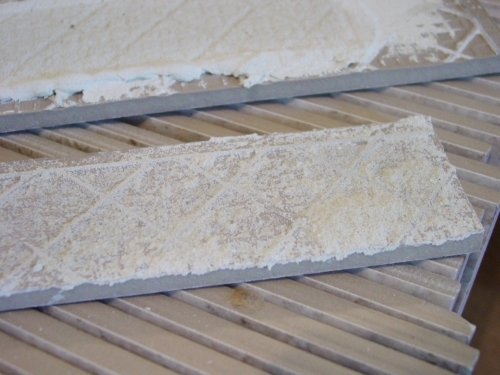 18×18 porcelain were tiles used in the test. A year has gone by since that test. During that period the folks at Bostik have been busy getting Ditra-set into their distribution chain. Until recently I wasn’t able to buy it in Texas. That’s no longer the case. Interceramic, one of my major suppliers, is now handling Ditra-set. 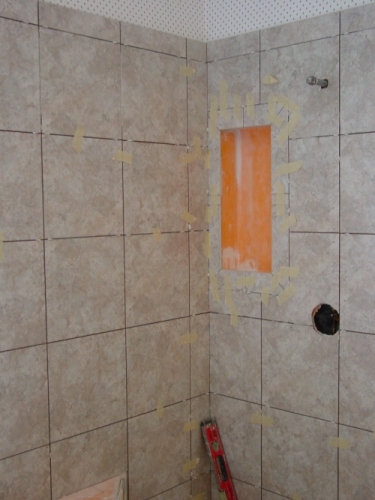 I’m working on another Kerdi shower, and I’ve done another test with a different porcelain tile. That’s the same old masonry chisel used in the first test. I knew better than to bother with the margin trowel. The conditions of the first test apply to the second. 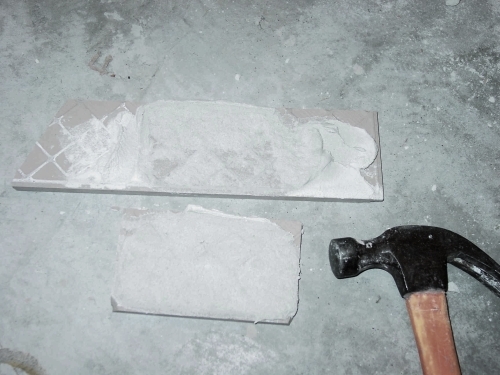 I cemented the pieces together in the afternoon and chopped them apart the following morning. Same result as the first time. Plenty of mortar remaining on both pieces. The result was really no surprise. Although more mortar pulled away from one piece than the other, an ample amount remained on both. Perhaps I burned the material into one scrap better than the other. It doesn’t matter, though. That is an excellent bond. The current shower in progress. Both the Kerdi membrane and the tiles are attached with Ditra-set. Ditra-set is priced right. It costs about the same as the VersaBond® I use for a lot of applications. 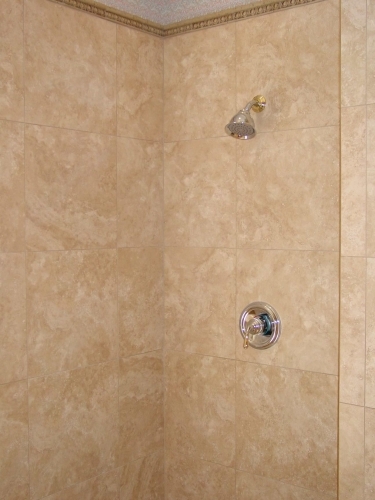 VersaBond, a lightly modified mortar, is made by Custom Building Products. Both products currently cost about $15. I don’t believe you can buy a decent thin set for much less than that. 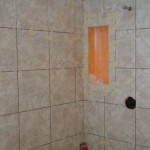 I recommend Ditra-set not only for Schluter products, but for any other application where dry set mortar is called for. Would I use Ditra-set for everything? No, certainly not. There are other thin sets that do a better job in different applications. My friend Dave Gobis of the Ceramic Tile Education Foundation is fond of saying “one size doesn’t fit all.” Choose your products based on the conditions that apply. When it’s Schluter Ditra or Schluter Kerdi, make that product Ditra-set. I certainly intend to from here on out. I mentioned above that thin set is made from portland cement. The term “portland” has become a trade term for construction cement, the powdery material that comes in large bags. Portland cement works by a process known as hydration. It does not need air to dry, and therefore, it cannot be pre-mixed and preserved in a container. Unfortunately, a number of thin set and adhesive manufacturers have usurped the term “thin set” and applied it to organic adhesives which are also used to bond tile. “Pre-mixed thinset” can be found on the shelves of home centers and lumber yards throughout North America nowadays. The products are usually sold in plastic tubs. In the tile trade, organic adhesives are most often called mastic, and mastic is a material that requires air in order to dry. Additionally, most mastics are not waterproof over the course of time. They can re-emulsify when subjected to periods of wetness. 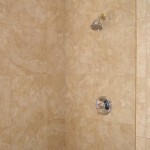 Therefore, mastic’s uses are limited and specific within the industry. “Pre-mixed thinset” is not thin set mortar; it is mastic, and it should not be used in wet areas such as ceramic tile showers. Nor should it be used under floor tiles. Unsuspecting consumers have been steered toward the so-called pre-mixed products by equally unsuspecting store employees. “Why go to the trouble of mixing that messy stuff when this product does the same thing?” Following that logic has cost more than one do-it-yourselfer his shower project. Don’t be misled by “the expert in the aisle.” Use real portland cement thin set, the messy stuff that comes in a 50 pound sack.